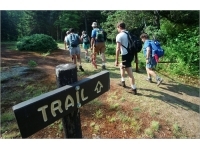 If you love adventure and beautiful scenery check out these hiking trials in MA. 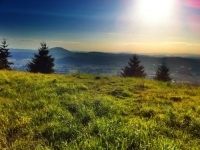 Enjoy the fresh air and the amazing scenery as you hike up mountains or through the woods. When you look through our guide to the best Massachusetts hiking spots, you can't go wrong! Some of the trails are short, and well maintained lasting only about 15-20 minutes round trip. 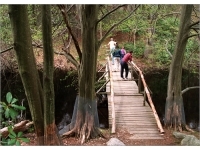 Other trails are more primitive and can take several hours to walk. This is a great place to take the dogs. Just be careful with everyone's footing on some of the rockier parts. There are a bunch of trails to choose from, and the park even offers options depending on your level and how much time you want to spend. The trails are extremely well-marked. There will be challenging sections, but nothing too tough to handle by any means. The hilltops offer great views of the surrounding area and even the Boston skyline on a moderately clear day. With more than 12,000 acres of MA beauty and miles of hiking, biking and horseback riding trails many ponds in the park and both tall and scrub pine forests make for a great place to explore. You will find a well-guarded swimming beach at College Pond in the summer. The campgrounds are very well maintained. You need to ensure that you bring whatever you need as there are no stores in the park. A section of the Charge Pond area is set aside specifically for horse camping. 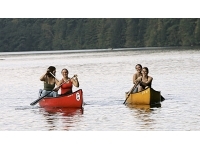 A day-use area at College Pond offers picnicking, swimming, fishing, canoeing. Fifteen miles of bicycle trails, 35 miles of equestrian trails and 13 miles of hiking trails take visitors deep into the forest, which includes one of the largest contiguous pitch pine/scrub oak communities north of Long Island. Boston's best kept secret for hiking! Less than an hour away from the city, Dover's Noanet Woodlands delivers nearly the same excitement as larger reservations like Blue Hills, but with a more diverse environment of woodlands, pine forests, meadows, and ponds and a quieter setting away from major highways. They think it’s the more than 17 miles of shady trails and woods roads you’ll find here for walking, cross-country skiing, snowshoeing, and horseback riding. Enjoy leisurely strolls, mountain biking, and birding – you might even hike to the top of Noanet Peak for terrific views of the Boston skyline. You will wish you were here right now! Great Brook Farm State park is the best place to enjoy the outdoors and hiking in Massachusetts. You will find large hilly grassy areas, dirt paths through wooded areas, great ice cream and an animal farm for the kids at heart. There is a pond there, and just like anywhere else nearby, you will agree that the best time to go is when it is breezy and sunny. Take advantage of the easy, cheap parking. There are over 20 miles of trails available for walkers, hikers, mountain bikers, and horseback riders. During the winter months, cross-country skiing is available and one trail is lantern lit for a "moon light" experience! The ice cream stand is open through the month of October. Hale Reservation is a private, non-profit educational organization that manages 1,130 acres of woodlands, including four ponds and over twenty miles of hiking trails in Westwood and Dover, Massachusetts. 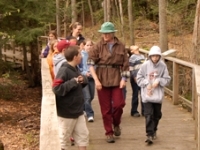 Hale is most widely recognized for its summer day camp programs which annually serve over 4,400 children from 70 communities in the Greater Boston area. 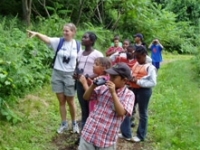 Hale Reservation also offers a family program, outdoor and environmental education experiences for children and adults, and open space for casual recreational use. Hale’s Main Office Hours are weekdays from 9:00 a.m. through to 5:00 p.m. The reservation is open to the public 365 days a year. The summer Hours are 7:30 a.m. to dusk or 8:00 p.m. During the winter hours, they are open from 7:30 a.m. – 5:00 p.m. Enjoy the Nature at its Best! You will climb to the top of 5 different rocky hills and will pass along the shores of two beautiful lakes. There is a beach for you to relax at and from the top of your climbs you will have great views over the lakes and to the skyscrapers of Boston in the distance. There are a lot of trails that criss-cross the area but not to worry, there is always a paved road within about a quarter mile of you if you ever do get off track and there are plenty of signs, trail markers and even rangers to guide you when you go hiking here in MA. This is a beautiful trip, particularly in late summer or early fall. At that time, shorebird viewing is at its prime, boat traffic diminishes, and the changing colors of the marsh add to Wellfleet’s already considerable beauty. For the Cape, the area is unusually quiet; the natural environment is aided substantially by the presence of the 1,000-acre Massachusetts Audubon Wildlife Sanctuary on the south side of Lieutenant Island. Misery will love your company! 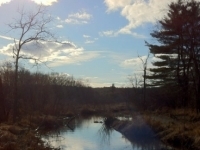 The Mount Misery conservation land provides excellent views of the Sudbury River and Fairhaven Bay, while passing through a deeply shaded hemlock forest and a patch of open marsh. Wildlife flourishes along the river, and you just might catch a glimpse of a deer, barred owl, muskrat, or red fox. Two newer inhabitants, which also can be seen with a little luck, are the wily coyote and the beaver. The beaver has reestablished itself here with help from the Massachusetts Division of Fisheries and Wildlife. This is a great place to go hiking in Massachusetts. Dogs can have their day! Go mountain biking around Callahan State Park you won’t be disappointed. Dogs are allowed here. The park has many trails running through it. There's quite a variety of terrain, from challenging hills to bridges to level ground. The trails are fairly wide, meant to be used by several people at once, so don't expect any single tracks. 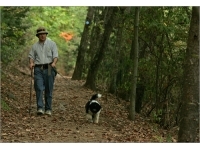 It’s a great place to hike and walk with your canine companions in MA. But, it is a multi-use park that has mountain bikers and horseback riders. The open field near the pond is a great gathering place for dogs to play with each other. This place is a very beautiful place for adults, especially if you are out with the kids. 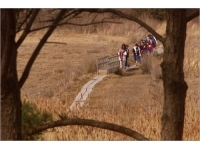 People come from all around MA to hike and catch a glimpse of all sorts of animals and the astonishing scenery. The amazing scenery and the exploding wildlife is everywhere, birds eat out of your hands and every evening the deer come out from the woods into this big open field and it's breathtaking. A must see for the outdoor enthusiast. You will get some beautiful pictures of wildlife while visiting this gorgeous place! The Visitor Center is open during the months of May 1 through to October 31 from Tuesday until Friday, 9:00 am – 4:00 pm. On weekends and holidays from 9:00 am – 5:00 pm. During the months of November 1 - April 30 from Tuesday through Sunday and holidays, 9:00 am – 4:00 pm. The Trail are open from dawn to dusk, Tuesday-Sunday and Monday holidays only. 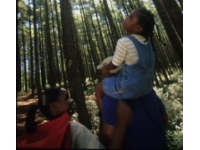 Become a friend of Middlesex Fells! Middlesex Fells is as close to wilderness as it can get for a reservation less than 30 minutes away from one of the country’s largest cities. Touring the Fells on the Skyline Trail, you may sometimes believe you are deep in the woods of New Hampshire. Indeed, do not mistake the Skyline Trail for a quick afternoon hike in MA. At about 7 miles in length, it is a real hike that can take most of a day if you like to stop frequently. 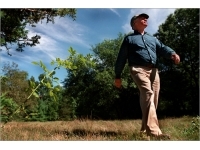 The Middlesex Fells Reservation is open from dawn to dusk. The large parking areas are gated and are usually open by 9:30 am and locked within a half hour after sunset. The small parking areas are always open. Parker River National Wildlife Refuge was established in 1942 to provide feeding, resting, and nesting habitat for migratory birds. The refuge occupies 4,662 acres on the southern two-thirds of Plum Island, a barrier island on the Northeast coast of Massachusetts, and is administered by the US Fish and Wildlife Service, a federal agency. Parker River is one of over 550 Refuges in the National Wildlife Refuge System, a national network of lands dedicated to "wildlife first." Today, Parker River provides pristine coastal habitat for over 300 species of resident and migratory birds, as well as a large variety of mammals, insects, fish, reptiles and amphibians. This is a beautiful place to go fishing in MA! Come and see a living and breathing legend! Explore Laughing Brook’s 353 acres of woodlands, meadows, and streams along its four-mile trail system. Be on the lookout for the many signs of wildlife that live at the sanctuary, including fishers, warblers, thrushes, various reptiles, and amphibians. Listen for the running brook and for kingfishers and other migratory birds, which signal the return of spring at Laughing Brook. In the fall, enjoy the many colors of the forest and the wildflower-filled meadow. In winter, a variety of wildlife tracks can be found in the snow. It feels like one of the nicest places in the country! The High Ledges is a wildlife sanctuary located in Shelburne, Massachusetts. The 587-acre property, located on the northern portion of Massaemett Mountain, is owned by Massachusetts Audubon Society. This is the best place to view wildflowers, birds and wonderful views of the valley. There are lots of trails to hike and spend the day with family and friends when you're in Massachusetts. It can take several days to do all the trails if you pace yourself. In the spring you can see hundreds of lady slipper flowers. Feel free to look but try not to touch. Take as many pictures as you like, you will be enchanted by all the colors you see, there will be lots of pink and some yellow. While walking along Arcadia’s five miles of trails, look for signs of white-tailed deer, black bear, otter, beaver, and other interesting creatures. 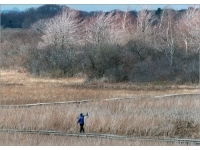 The sanctuary’s forest, meadows, marsh, and wetlands are great places to explore at any time of year. Canoe along the river on a summer’s night during a program, and you’re likely to see an enchanting display of fireflies. The Arcadia Wildlife Sanctuary’s trail hours are Monday through Thursday, 9 a.m. - noon, Friday 9 a.m. - 3:30 p.m., Saturday, 9 a.m. - 3:30 p.m., Sunday and most holidays, noon - 3:30 p.m. They are closed on Thanksgiving, Christmas, and New Year’s Day. Come and spend the day hiking in MA. 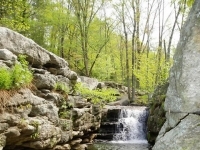 Lime Rock Nature Preserve is a one of the smallest and newest preserves in the state. Established in 1986 it has become extremely popular with botanists and geologists because of its unique features. For such a small area it has a huge population of rare plants and unusual stone formations. 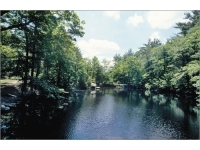 The Lime Rock Preserve is unique for its variety of habitats including woodlands, streams, open water and calcareous ledges. 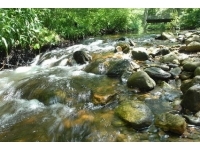 The Moshassuck River and the Manton Reservoir are both highlights along the MA hiking trail. The 130 acre Preserve is an excellent place to watch the seasons change, take in the views of the pond, look for birds like migrant warblers, or look for animal tracks in the snow. This is a hike through woods, along streams and marshes in MA. Part of the trail is also a road. Come and see a fair number of birds of varying species during the warmer seasons. There are even recent signs of beaver activity in the area. The trail is a path with a rough beaten or dirt/stone surface used for travel. It may be used by walkers and in some places provide a main access route to remote settlements. 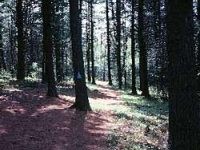 This trail can also be used for hiking, cycling, or cross-country skiing. Its a fun and easy hike! 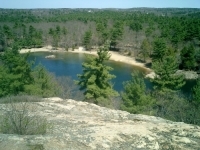 This is one of the favorite local hikes in MA and places to run (off road). The trails are well established, well-marked, easy to follow, provide varied terrain and are secluded (yet easy to get to). The elevation change going directly up to the summit of Mount Pisgah is small (50 feet), but the overall change on the series of trails can be in excess of 250 feet when the whole area is hiked. people have come here many times and always love the experience. The Boston Nature Center is an urban sanctuary, located on the grounds of the former Boston State Hospital, offering public programs year-round. Two miles of trails and boardwalks traverse meadows and wetlands where wildlife abounds, including coyotes, pheasants, and many species of birds. The sanctuary's George Robert White Environmental Conservation Center is one of the "greenest" buildings in Boston. Open Monday-Friday, 9:00 a.m. - 5:00 p.m., weekends and holidays, 10:00 a.m.- 4:00 p.m. 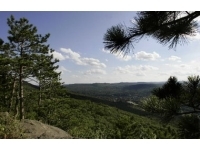 This is a great hiking spot in Massachusetts! Mother Nature is waiting for you! This mostly wooded sanctuary consists of two separate parcels that are contiguous to a larger complex of preserved land owned by the Town of Westford. Mass Audubon's 42-acre Concord Road parcel features a short loop trail through a white pine-oak forest. In spring, listen for the calls of the wood frog as you pass close to the vernal pool or search for migrating warblers. You may continue your walk on the multiple use recreation trails that meander through town land and the other parcel.